It may be hard to believe, but this tiny bottle of 8X ultra-concentrated Method laundry detergent can do big things! That’s because the plant-based formula with smartclean technology® seeks out dirt and stains in a revolutionary new way to deliver beautifully clean clothes with just 1/4th the dose of the leading brand. Plus, its handy pump makes for easy, one-handed use. No mess. No waste. No aching biceps. 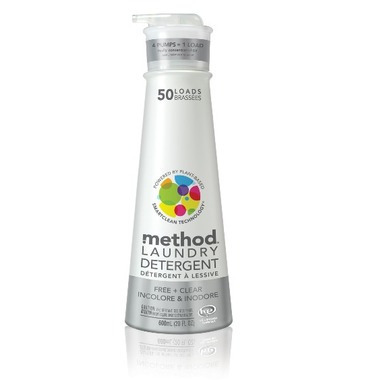 This Method Laundry Detergent is shamelessly clean. No dyes. No perfumes. So glad I found this. Easy pump, works well, no smell, kind to my septic system. I love this laundry soap! My husband has sensitive skin when it comes to all those high fragrent detergents. We switched to this and we all love it. Our clothes come out smelling fresh. Easy to use, cleans well, all in a pump bottle. An excellent environmentally friendly option. Will buy again. Cleans really well and not much is needed. Love the bottle and will definitely purchase again. Cleans well with no scent. Love the pump bottle so easy to use and no mess.